We would like to acknowledge the Whadjuk Noongar people whose land we are standing on and recognise the strength, resilience and capacity of the Noongar people where Curtin University is situated. We pay our respect to their vibrant and endless culture and the leadership of the Elders past, present and future. This country (Boodja), where Curtin University is situated, has belonged to the Whadjuk Noongar people for thousands of years and is now a place of learning for all people. Curtin University is very proud to continue on with this very long tradition. This artwork was created by Jade Dolman, Aboriginal Artist and Cultural Educator. It represents children and adults sharing knowledge around the campfire. Jade is a Whadjuk Nyoongar (Mother's side), Eastern Arrernte (Father's side) young woman from Perth. She practices acrylic painting on canvas as well as designs logos and murals. Her signature Personalised Message Stones have become her most popular seller. Jade remains connected to her culture through painting and family. 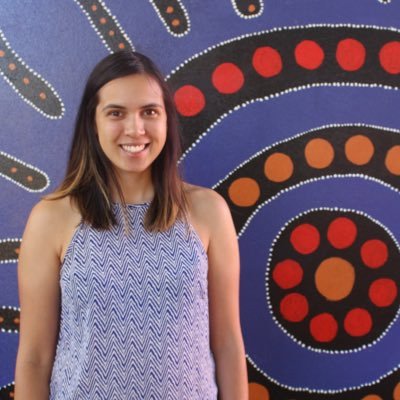 She has a passion for making a change for Indigenous Australians especially youth through different forms of art whether it be through painting or dance. She teaches Aboriginal dance and runs Aboriginal art workshops in schools, for organisations and companies. Prior to starting her business, Jade has had and continues to have a lot of involvement with youth. She has done mentoring for Wirrpanda Foundation and Save the Children. She currently works/volunteers on a casual basis for Nyoongar Sports Association and Department of Child Protection. She recently graduated from an Aboriginal women's leadership program called Yorga Djenna Bidi which was erected by Leadership WA. During her secondary schooling years Jade was involved in many sports and extra-curricular activities. She was selected in the under 17's State Volleyball team representing Western Australia. She also played in the State League Netball Competition representing Perth Lions. In year 12 she was elected as House Captain and Prefect and was presented with the All Rounder Award at the Graduation Ceremony.